Osteoporosis is a disease marked by reducing bone mass, density, and quality. This makes bones weak and brittle. If left unchecked, it can lead to broken bones . Breaks of special concern are of the hip , spine , and wrist . But, they can happen anywhere. 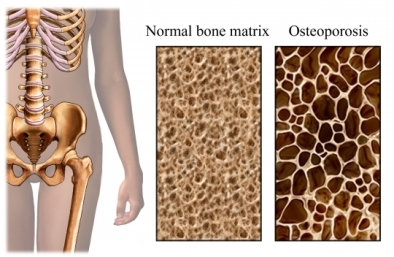 The loss of bone faster than it is formed causes osteoporosis. Bone loss happens faster after age 30. There are many factors over a lifetime that can lead to osteoporosis. It’s more likely to happen if full bone mass was not reached during your bone-building years. Care mainly involves lifestyle changes and medicines. The goal is to lower the chance of breaks and slow bone loss. Don't smoke. If you smoke, talk with your doctor about ways you can successfully quit . Exercise improves bone health. It also increases muscle strength and balance. Weight-bearing and strength-training offer the best benefits for your bones. Balance training may help lower the chances of falls and breaks. People who do not eat enough calcium and vitamin D from foods may need supplements. Don’t take them without talking to your doctor first. Floors—Remove all loose wires, cords, and throw rugs. Reduce clutter. Make sure rugs are anchored and smooth. Don’t move furniture around. Bathrooms—Put grab bars and non-skid tape in the tub or shower. Lighting—Make sure halls, stairways, and entrances are well lit. Put a night light in your bathroom. Turn lights on if you get up in the middle of the night. Kitchen—Put non-skid rubber mats near the sink and stove. Clean spills right away. Other precautions—Wear sturdy, rubber-soled shoes. Ask your doctor whether any of your medicines might cause you to fall. Building strong bones throughout your early years is the best defense. Getting enough calcium, vitamin D , and regular exercise can keep bones strong throughout life. Live a healthy lifestyle—avoid smoking and drink alcohol only in moderation (2 drinks or less a day for men, 1 drink or less a day for women). If you have gone through menopause and are at high risk for broken bones, medicines may be advised to prevent osteoporosis. Clinician's guide to prevention and treatment of osteoporosis. National Osteoporosis Foundation website. Available at: https://www.nof.org/prevention/. Updated 2013. Accessed June 22, 2018. Diagnosis information. National Osteoporosis Foundation website. Available at: https://www.nof.org/patients/diagnosis-information. Accessed June 22, 2018. Ho-Pham LT, Nguyen ND, Nguyen TV. Effect of vegetarian diets on bone mineral density: a Bayesian meta-analysis. Am J Clin Nutr. 2009;90(4):943-950. Khosla L, Melton LJ. 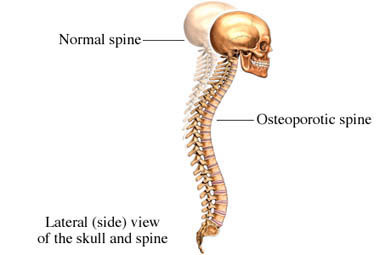 Clinical practice: osteopenia. N Engl J Med. 2007;356(22):2293-2300. Osteoporosis. EBSCO DynaMed Plus website. Available at: http://www.dynamed.com/topics/dmp~AN~T113815/Osteoporosis . Updated February 1, 2018. Accessed June 22, 2018. Osteoporosis causes and risk factors. EBSCO DynaMed Plus website. Available at: http://www.dynamed.com/topics/dmp~AN~T902594/Osteoporosis-causes-and-risk-factors . Updated May 9, 2018. Accessed June 22, 2018. Osteoporosis tests. Ortho Info—American Academy of Orthopedic Surgeons website. Available at: https://orthoinfo.aaos.org/en/diseases--conditions/osteoporosis. Updated August 2009. Accessed June 22, 2018. Sambrook P, Cooper C. Osteoporosis. Lancet. 2006;367(9527):2010-2018. 10/6/2006 DynaMed Plus Systematic Literature Surveillance http://www.dynamed.com/topics/dmp~AN~T113815/Osteoporosis : Cockayne S, Adamson J, Lanham-New S, et al. Vitamin K and the prevention of fractures: systematic review and meta-analysis of randomized controlled trials. Arch Intern Med. 2006;166(12):1256-1261. 1/30/2009 DynaMed Plus Systematic Literature Surveillance http://www.dynamed.com/topics/dmp~AN~T115979/Glucose-lowering-medications-for-type-2-diabetes : Loke YK, Singh S, Furberg CD. Long-term use of thiazolidinediones and fractures in type 2 diabetes: a meta-analysis. CMAJ. 2009;180(1):32-39. 12/29/2009 DynaMed Plus Systematic Literature Surveillance http://www.dynamed.com/topics/dmp~AN~T113815/Osteoporosis : Hippisley-Cox J, Coupland C. Predicting risk of osteoporotic fracture in men and women in England and Wales: prospective derivation and validation of QFractureScores. BMJ. 2009;339:b4229.